Springtime is ripe with fleas and ticks. 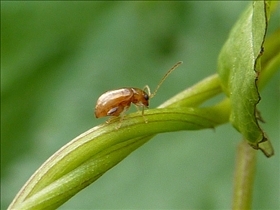 Some insects display parasitic behavior in interactions with animals as well as with humans. This is the case for fleas and ticks. To remove them from a household there are certain solutions to be aware of. A spray which contains insect an growth regulator can be of help to kill eggs and intermediary stages of flea growth known as pupae. Vacuuming is another good solution, but be prepared to throw many vacuum bags. Ticks have natural predators in the guinea fowl and the Ichneumon wasp. Chemicals can also be used on pets and humans, but only under certain conditions. A flea is a member of the Siphonaptera order. It is a wingless insect having a specially design mouth part which pierces animal and human skin. The flea is a parasite which lives by feeding on the blood of its host. A tick is an arachnid from the super family Ixodoidea. It is an external parasite which also survives by feeding on the blood of animals and humans. The tick is a carrier of diseases such as the Lyme disease, Q fever and Colorado tick fever. A flea is very small, measuring up to 3.3 mm from head to claws. The body parts of a flea are the head, the thorax, the abdomen and the claws. The usual color is dark brown and they can jump using their long legs up to 7 inches vertically and 13 inches horizontally. This is their main locomotion system given that they do not have wings. The body is covered with a thick skin with hairs directed backwards to ensure speedy movement. Fleas can resist superficial crushing attempts. 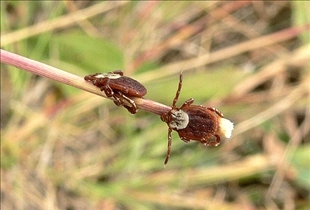 A tick in its adult stage presents a mouth part specially designed to pierce the skin. The body is covered with a thick shield. The abdomen which stores the blood expands its volume after each meal. The segmented legs are strong enough for the tick to resist attempts to be removed. A flea has four development stages: egg, larva, pupae and adult which can last from two weeks to eight months. As an adult it can begin to feed on pets and humans leaving itchy red stains on their bodies which may swell after being scratched. Similarly, ticks leave red spots where they have bitten the host. DEET products work best for keeping ticks and fleas away. The second best repellent is made with citronella and more people prefer the smell of citronella. Homemade flea repellents include these active ingredients: tea tree oil, lavender oil, geranium oil, eucalyptus oil. A bath with rosemary oil or garlic or apple cider vinegar may work. A flea is a wingless parasite insect which feeds on human and animal blood. A tick is an arachnid parasite which also feeds on blood. Fleas and ticks are small dark colored insects which have strong legs. They have a thick body as well and specially designed mouth parts. Fleas and ticks feed on their hosts leaving red itchy stains on the skin. Which pest is easier to get rid of? Flea is the common name for insects of the order siphonaptera which are wingless insects with the mouthparts adapted for piercing skin and sucking blood. Ticks carry the bacteria that cause lyme disease. People contract lyme disease by being bitten by these ticks.The symptoms of lyme disease are fever, headache, depression, tiredness, aching joints, stiff neck, swollen glands and skin rash. Lipstick vs. Lip Gloss: Colorful or Glossy?